Discussion in 'Effects, Pedals, Strings & Things' started by Sonic Bong, May 4, 2016. Hey everyone, I just bought this sweet pedal, used, from a guy that said it was from the late 70's. I paid 160€ with shipping. He said the only mods on it are the plug for standard power supply and the on/off led. Late 70's? 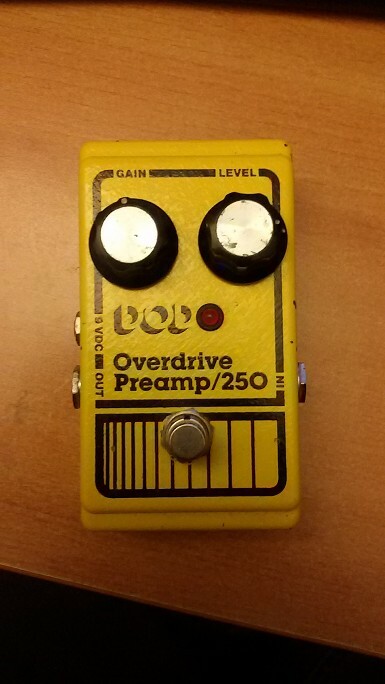 Here's mine I bought in 1982 which I believe was the first year of the pedal. It's identical to yours minus the mods. Mine has never been modded in any way. 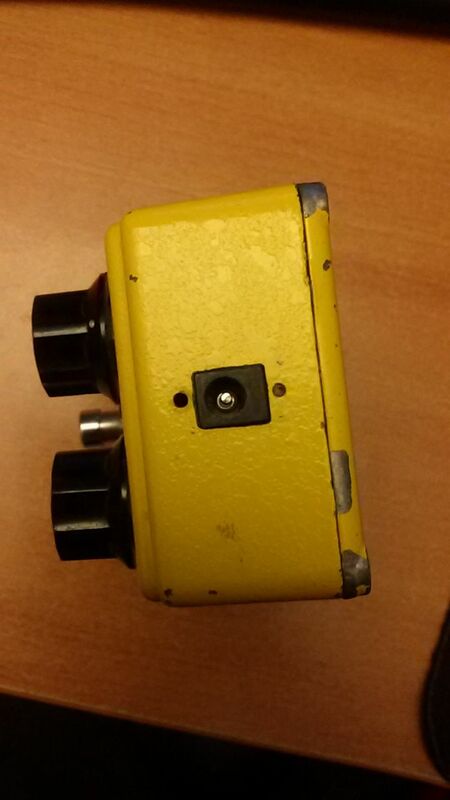 It looks like it has a TL072, that would place it in the transition period between the late 70's early 80's. Most likely '81. Here's the rub, that OPA is socketed, we never socketed production units. So it has been modded with that socket too, and it also has zeners in place of the Si diodes, and is true bypass modded, (I'm also seeing some stacked resistors and non-stock values) so even further modded than stated. This likely sounds very different from a stock 250. Well this is a bummer. I really liked the sounds from my tiny amp at home, if I like it so much when I take it to band practice I'm keeping it, otherwise I'm asking for a refund. 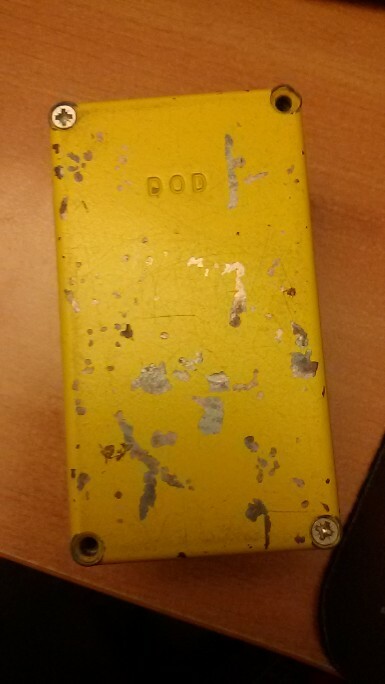 If this can help to find out the production date, the black chip says "Tl081CP Malaysia"
Red one says "0 1 473M 100V"
There's a tiny sheet of paper glued on metal behind the PCB, " 43 6-29-81 " written on it. Also do you guys think there's a way to find out the exact mods? And it looks like one leg of a cap isn't connected. Thanks for all the info so you think the sound may be that different from a stock '81 Dod 250? I can feel it is slightly low on the output , because I need to turn the volume know to 3/4 to match the bypass volume. Also it is true that a leg of a cap isn't connected! I probably need to solder it back on, even if I have zero experience in this..
Price seems high, but im no expert. Wow you paid waaaaay to much, even if it was original that would be a lousy deal. The current reissue is is great, and closer to a 70's original in specs. Now I feel like such an impulsive buyer! I still need to take it to band practice to judge. Is 160€ that high for such a pedal? It is ALOT of money for me, and I spent it thinking of a good deal..
That's what in USD? $180? That's about the going price for a stock '81 DOD 250. For a modded one, I'd say it should be around $80-$90 if you like how it sounds. I'm curious how it sounds with those zeners in place of Si diodes. Zener's typically distort at different voltages than Si, and I would imagine that the distortion characteristic of the 250 you have is quite interesting sounding. I use it for bass with a geekdriver, a pedal by "geek mac daddy" based on the colorsound overdriver, through a trace elliot 4x10. Also going to get a ds1 in a few days. Soon as I get to band practice I'm recording something to show you how it sounds! Thanks for all the replies!! It's hard to do, but try judging it ONLY with your ears. You say it sounds beautiful. Just think how happy you'd still be with it if you'd never asked TGP about it. DakotaRed and MIM#1 like this. I would definitely send it back. If you love the sound, then get one of the $50 reissues and mod it to your liking. It should be pretty easy to reproduce those mods (and do a better job of it, that's an ugly sort of work). Total cost far less than 100 euro. For 160 euro you should get a bone stock, beautiful pedal in excellent condition! Chicago Stompworks makes a nice clone of the grey 250. The green cap (under the red one in the picture) is "223J50 NIS S", and the one on the left of the black chip is "2A223K"
How can I fix the leg of the cap that isn't attached? I suppose I can't touch it with the pedal turned on right? And almost 20 days later, this is what I got! As you can hear it's pretty muddy, though with some proper equalization on the amp I sometimes get better results.